Nebraska lawmakers gave final approval to a bill abolishing the death penalty. The measure now heads to the governor, who has promised to reject the bill, but lawmakers believe they can override any veto. Lawmakers supporting the bill won by a vote margin more than big enough to override the promised veto from Republican Governor Pete Ricketts, who told the Associated Press it was a “dark day” for public safety after the vote. If the measure becomes law, Nebraska will be the first conservative state to overturn the death sentence since 1973. "Nebraska has a chance to step into history — the right side of history — to take a step that will be beneficial toward the advancement of a civilized society," Senator Ernie Chambers of Omaha, who introduced the bill, told the AP. Chambers is an independent and death penalty opponent. What is unusual about the Nebraska vote is that it was driven by conservative and religious convictions that see the death penalty as a waste of taxpayer money, and question whether the government can be trusted to manage the process. The speedy passage of the bill, which was introduced in January and passed in May, rests in part on lawmakers acknowledging that the death penalty had “exerted a degrading corruption” on the office of the Nebraska Attorney General and the state Supreme Court, which issued a death warrant for inmate Carey Dean Moore In 2011. What the AG office had hidden from the court in that case, however, was that the execution couldn’t be carried out because sodium thiopental, one of the three drugs mandated for use in lethal injection executions, was not legally available. The Department of Correctional Services obtained the substances, which were of unknown effectiveness, from a foreign distributor and manufacturer that was neither registered nor approved by either the Food and Drug Administration or the Drug Enforcement Agency. When this was discovered, the AG’s office was criticized, and Moore’s death warrant was revoked. Ricketts has promised to veto the bill, a move that would prompt a veto override vote next week. 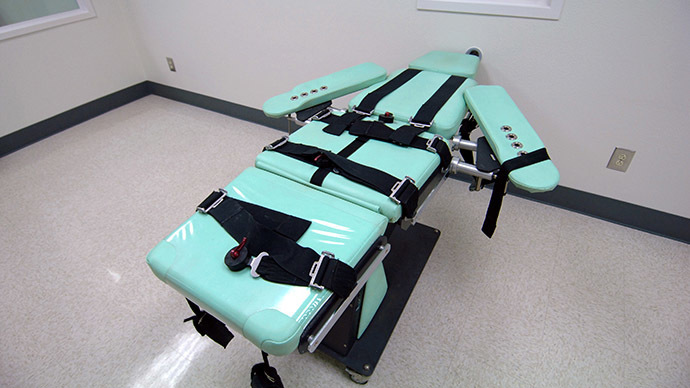 The governor announced the state had acquired new lethal injection drugs with which to resume executions.